Abraham Bain was born August 10, 1906 in St. Petersburg, Russia and grew up in Newark after living briefly in Cambridge, Massachusetts. His family moved to America when he was a child. For much of his life he claimed he was born in Cambridge. Newark had a vibrant working-class Jewish population in the ‘teens and ‘twenties. However, Abie’s family was not part of this culture. They lived in the Third Ward, ever on the edge, fighting for survival. Abie was a fighter as long as anyone could remember. He first climbed into a boxing ring at the age of 12 and was a natural. He turned pro five years later, defeating Billy Boyle in three rounds during his first of 80 bouts. Abie fought in Newark’s various arenas—including Laurel Garden—as well as Harrison, Paterson, East Orange and Elizabeth over the next four years, rising in class from flyweight to middleweight. He won more often than he lost, with his most notable early victory coming against Jack McVey in 1926 on a disqualification. 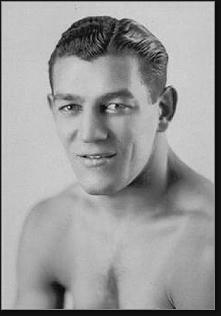 Between fights, soft-spoken Abie was one of several Jewish boxers who provided occasional muscle for bootlegger Longy Zwillman. At Zwillman's behest, they formed a group called The Minutemen, which specialized in cracking heads at Nazi rallies. Starting in 1929, Abie began getting bigger fights, often outside of New Jersey. In 1930 he defeated middleweight contender Pal Silvers in Madison Square Garden, and later that year earned a shot at the light heavyweight champion, Maxie Rosenbloom. Outweighed and outfought, Abie got pummeled but stayed on his feet until a TKO in the 11th round. Just over a year later, Abie got another shot at the light heavyweight crown, against Dave Maier, but hit the canvas in the opening round. Abie often fought out of his weight class. In 1931 and again in 1935, he took on Two Ton Tony Galento, who outweighed him by 70 pounds. The second fight resulted in a trip to the hospital for Abie and shortened hs career. He also fought Al McCoy in 1935 for a light heavyweight title in Canada, but lost badly. He fought just twice more before retiring with a record of 48 wins (half by knockout) 27 losses and 5 draws. His final bout was a draw in Los Angeles. Abie stayed in California and found work in films as a technical adviser, extra and stuntman. His daughter, Babette, became a movie actress. Abie worked on Kid Galahad and also Knockout, in which Anthony Quinn played a crooked fight manager. In 1962, Quinn played washed-up boxer Mountain Rivera in Requiem for a Heavyweight. Quinn said he modeled his character after Abie Bain, particularly his soft, gravelly voice and mannerisms. Quinn actually lived with Abie briefly so he could study him. Abie also had a small role in the film. Among his Hollywood friends were Robert Wagner. Albie was Wagner's stunt double for the 1956 movie Between Heaven and Hell. In 1976, Abie was inducted into the New Jersey Boxing Hall of Fame. In 1991, he was immortalized by Philip Roth in an unforgettable passage in Patrimony. Abie retired to Florida a few years later and passed away in 1993 at the age of 86.